It’s has been quite some time since spy-shots of a Lancia prototype have surfaced, but here are the first pictures of the facelifted Lancia Ypsilon, due to be presented at the Geneva Show in March next year. It is believed the engines and other mechanical systems will be left untouched, but the grille and the bumpers front and rear will get an overhaul losing the massive black plastic bars. 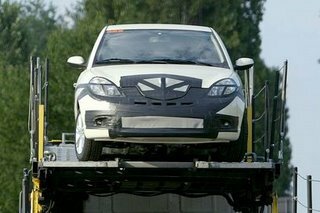 Headlamps and taillights as well as the fog-lights appear to be re-shaped, too, and we assume the Ypsilon’s interior will be freshened-up as well.